In his influential book Purple Cow, marketing guru Seth Godin urged organisations to become “remarkable”, to “find things that are ‘just not done’ in your industry” in order to stand out from the crowd, or the herd, as it were. Since Purple Cow was published, the ‘noise’ of organisations vying to “Brand Out” has increased exponentially, with reputations made or broken, not only “one cup at a time”, in Starbucks CEO Howard Schultz’s term, but also one TripAdvisor review or one Tweet at a time. escape from work and home and enjoy “just being”, with their favourite beverage in hand. For Starbucks too, that field has been invaded with competitors, with cows of every breed. In its efforts to remain the Purple Cow, Starbucks has sought to reiterate its unique sense of being not just a coffee shop. Every store has a community noticeboard, and (although not alone in this) the company ensures that customers are aware of those other communities, far away, where the coffee comes from, which are served by a responsible supply chain. 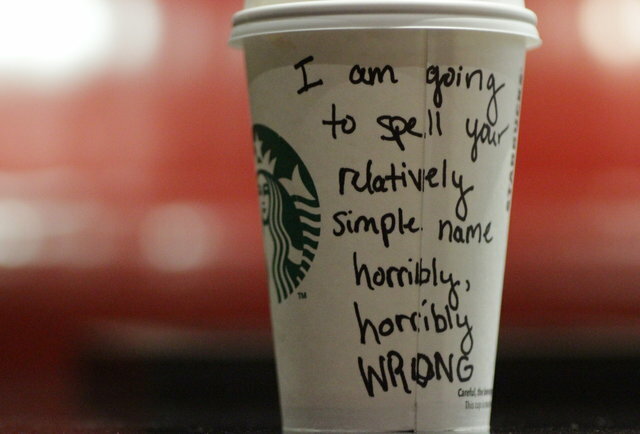 In recent years, Starbucks introduced its now-infamous ‘customer’s name’ policy – in order to improve service and and increase the sense of “connectedness”, customers are asked for their name, which is inscribed on their cup, and then called out to indicate that their order is ready. This might have sounded like a good idea – maybe an “insanely great” idea. But there was (and is) a problem: names are a very personal thing. Not everyone feels comfortable giving their name to a stranger, let alone having it shouted out in front of a lot of other strangers. And there’s a second problem (you know what’s coming): names are not always spelt how they sound. So, unless Starbucks could teach every employee how to spell every name in the world, this policy was asking for trouble. And of course, it hasn’t taught its employees how to spell every name; nor has it taken into account not only the diversity of its customers, but also the diversity of its staff. The result: embarrassed staff and irritated customers – “one cup at a time”. And one Tweet at a time. Now Starbucks has announced (in the US) a new initiative: put simply, employees are asked to write “Race Together” On every cup. Why? To create in customers “a renewed level of understanding and sensitivity about the issue [that] they themselves would spread…to their own sphere of influence” (according to Schultz). Which begs the question, has Starbucks learned nothing? Whilst it can be argued that Starbucks’ USP – its “Purple Cow-ness” – derives from its enthusiasm for “connectedness” and inspiring conversations that (in the sanctuary of the “third place”) are important and therefore worth having – there is a far more fundamental principle at play here. Simple logic would say that that is a ‘tall order’ (pun intended) indeed. The real sadness – and the real danger for Starbucks – is that it does not appear to have done a single thing to equip its people to facilitate this initiative. And the likely outcome is that soon, the social media noise will no longer be about Starbucks’ employees’ inability to spell simple names: it will instead be about (at best) the mild amusement and (at worst) the grievous offence caused by their attempts to instigate complex conversations about race. Admittedly, Starbucks has been holding “Open Forums” for its employees, where they are encouraged to talk about their experiences of race. The forums have been held in Seattle, Oakland, California, St. Louis, New York, and Los Angeles; each includes about an hour of open mic time, with Schultz presiding. This, however, does not equate to providing every employee with the necessary skills and knowledge to tackle this issue with customers. Starbucks’ latest initiative, then, already looks certain to help it “Brand Out”. Let’s hope it’s not for all the wrong reasons.